Sure, there are countless (and we mean countless) brands that design utterly beautiful and photo-friendly pieces that definitely deserve a spot on your Insta feed. But among this vast sea of very Instagrammable fashion labels, we may have just found The One—the most Instagrammable brand yet, and it's the brainchild of Paris-based blogger Anne-Laure Mais. The brand, which just launched this week, goes by the name Musier Paris, but as the website explains, it's more than just a "brand." 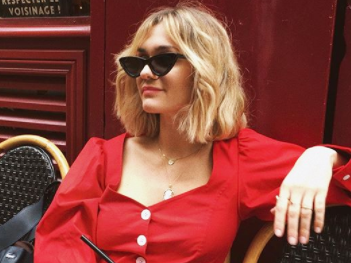 Rather, it's a "reflection of this new generation of connected and inspiring muses that we all want to look like"—the muse, in this case, being the always effortlessly chic French girl. Currently, 24 French girl–inspired pieces are available for purchase on Musier Paris (with new ones dropping every two months), including a poppy-printed silk V-neck top, the perfect little black dress with ruffle detailing and a black-and-white checkered jumpsuit, which features puff sleeves and a slight flare at the bottom. Now all we need is a trip to the Riviera.